Fault with new upvc door handle. Arrived on time, courteous, came out the day I called, took a couple of days, to get parts, fixed handles, great job. Fault with gate. Supply & Fit new lock. Very polite and amiable checked the lock, replaced it also and checked a lock on door of my car. Fault with Scandinavian Lock - supply and fit new parts. He got our lock replaced within an 1 1/2 of calling him. Very pleased with his efficiency. Handle to front wooden door had become insecure. Stuart responded very quickly and his work and expertise are of high quality. Warmly recommended to all. Fit gun safe to wall. Stuart arrived on time, he was very professional and polite, he explained what he would do and carried out the work expertly, no mess, I would definitely recommend him. Supply and fit new security lock and chain to front door. Supplied new lock and chain and fitted ,advised lock mechanism and latch plate damaged, advised replacement. Supply & Fit new locks to french doors. From initial phone call enquiry to work being completed, it was less than 90 minutes! On a Saturday too! 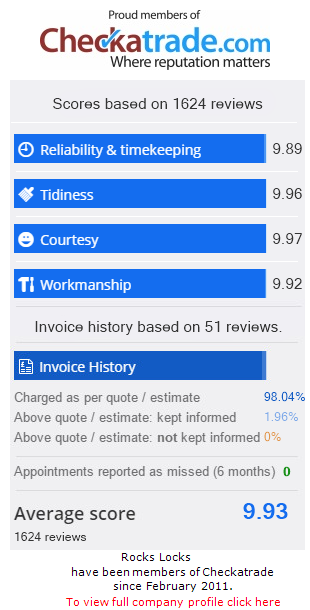 Fantastic service from a really polite, friendly and efficient guy/company. Thanks again Stuart for the great work done! I can rest easy now! Locked Out. Gained Entry with No Damage. 1st class, emergency service, especially on a Sunday. Locks Changed. Stuart turned up on time and changed all the locks around the house including the garage. Stuart was professional, courteous and friendly and left us plenty of spare keys for each room. I would not hesitate to recommend Stuart or use him again the future. Fault with uPVC back door. Very professional job well done ,will use him again.